We're very excited to share with you our Christmas sleigh routes for 2017! 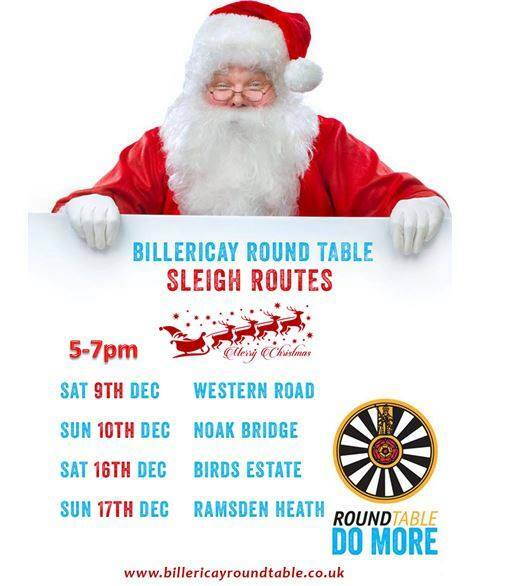 We will be out visiting four regular routes in Billericay and hope to cover them all weather permitting. If we cannot manage to get to your street or area this year, we would love to see you come and visit Santa at a street nearby. Please take a look at out routes to see exactly where we plan to be on each night. Unfortunately we cannot give timings but if you use Twitter you can track us there. A big thank you to our member Jim who recently refurbished the Sleigh for you all to enjoy. We will also have some of our friends and relatives supporting us this year who give up their evenings to ensure Santa's parades can go ahead. Please bear in mind that we may need to change or cancel our routes at short notice in the event of weather or lack of volunteer number changes last minute. We apologise in advance for any disappointment that may be caused should that be the case. Thank you for your continued support and we look forward to seeing you and your families soon. Our Facebook page will be updated with further information and updates when required. Ho Ho Ho Have a Merry Christmas!